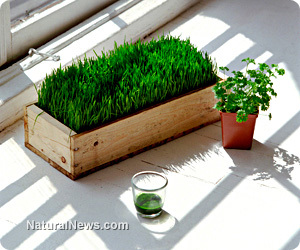 (NaturalNews) Wheatgrass is a gluten-free food prepared from the young shoots of the wheat plant, Triticum aestivum, which grows in temperate regions throughout Europe and the United States. Consumption of wheatgrass only became popular in the Western world in the 1930s, when an American chemist, Charles L. Schnabel (now known as the "father of wheatgrass"), began to popularize it. Schnabel became well-known in the 1940s for stating that "fifteen pounds of wheatgrass is equal in overall nutritional value to 350 pounds of ordinary garden vegetables." Though this claim is now considered to be exaggerated, it is true that wheatgrass is unusually dense in nutrients and is a potent detox food. 1.) Rich in chlorophyll -- Wheatgrass is one of the world's finest sources of chlorophyll, often containing over 70 percent of it. Chlorophyll is the molecule that gives plants their green color, and which helps them to photosynthesize (convert sunlight into chemical energy). In humans, chlorophyll is a powerful blood cleaner and builder. It delivers a continuous energy transfusion into our bloodstream, increasing and replenishing our red blood cell count while increasing our hemoglobin levels so that our red blood cells can deliver us increased amounts of oxygen. Since destructive bacteria cannot exist in the presence of oxygen, eating more chlorophyll-rich foods like wheatgrass can help guard us from a host of serious diseases, including cancer. 2.) Treats digestive conditions -- Wheatgrass contains a large number of digestive enzymes (substances that help reduce toxic and indigestible materials in food), and is known to treat several digestive conditions. One 2002 study published in the Scandinavian Journal of Gastroenterology, for instance, found that wheatgrass juice could help treat ulcerative colitis, an inflammatory bowel disease similar to Crohn's. Additionally, the UCLA Brain Research Institute found that wheatgrass can help improve indigestion, irritable bowel syndrome and acid reflux. Moreover, due to its high fiber content (weight by weight, wheatgrass contains 200 percent the fiber of bran), wheatgrass is also a well-known cure for constipation. 3.) Extremely nutrient-dense -- Perhaps wheatgrass' biggest draw is its phenomenal concentration of minerals, which rivals (and, in some cases, exceeds) that of better-known supergreens. According to a spectral analysis provided by Self's "NutritionData," four grams of wheatgrass (equivalent to one tablespoon of powder or 8 x 500 milligram tablets) contain 1,600 percent of our recommended daily intake (RDI) of vitamin E, 733 percent of our RDI of thiamin, 15,293 percent of our RDI of riboflavin, 1,250 percent of our RDI of niacin, 1,950 percent of our RDI of vitamin B6 and 7,000 percent of our RDI of manganese. Wheatgrass also contains huge amounts of zinc, copper, iron, pantothenic acid and vitamin K, as well as smaller amounts of vitamins A and C. This nutrient profile makes wheatgrass an excellent health supplement, and one that is far more potent (and natural) than the synthetic multivitamins found in supermarkets. Like most plant foods, wheatgrass contains no vitamin B12. Wheatgrass is widely available in powder, extract, capsule and tablet form. While it doesn't matter which form you choose, it is important that your wheatgrass is grown outdoors (indoor wheatgrass is susceptible to mold) in a clean, unpolluted environment. Generally speaking, favor certified organic wheatgrass grown by sustainable sellers in the United States, Australia and Europe, and avoid wheatgrass grown in China.